In Simon's latest Mindful Frog Audio Adventure, you'll be visiting the most famous rain forest in the world. We're in Brazil, and right on the Earth's equator where it's always warm. You'll find out why Sloths make their way down to the forest floor once a week, and what they love to eat more than anything in the world. For some excellent Sloth pictures to colour in you can CLICK HERE. They are a non-profit organization who research and take care of Sloths. You can Adopt a Sloth if you like, or go to their Online Shop where you can buy a fantastic Sloth calendar or book. 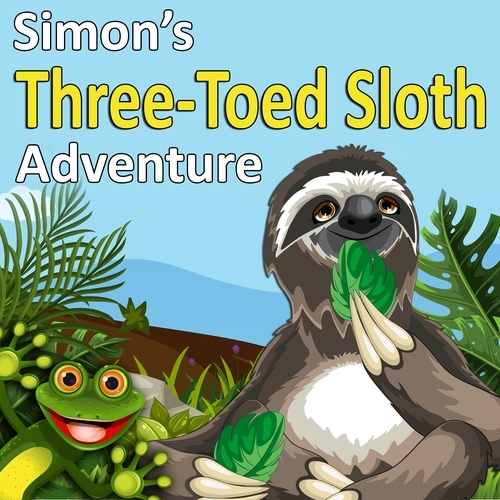 When your kids listen to Simon's Three-Toed Sloth Adventure they won't just be entertained, they'll be learning too. Check out the unbelievable Sloth facts below, they are astounding creatures. 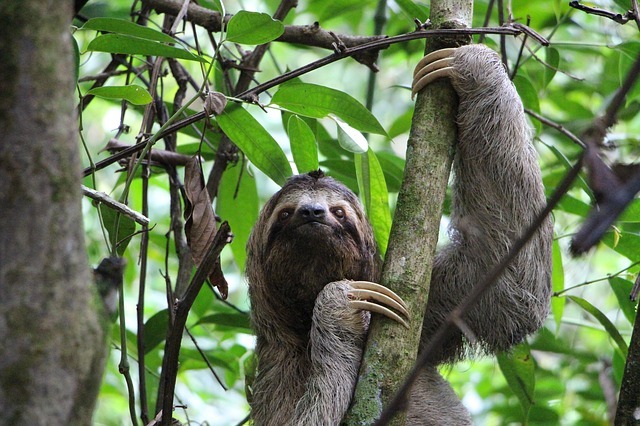 Sloths only come down to the forest floor once a week, to poo! They have an extra bone in their neck that lets them turn their head 270 degrees. Up to 700 Sloths may inhabit one square kilometre of rain forest, the same area would only have 70 Howler Monkeys. They don't control their body temperature well, so they sit in the sun to warm up and the shade to cool down. Many things live on Sloths e.g. Algae, Fungi, Beetles, Cockroaches, Moths, Ticks and Mites. The algae turns their fur green in the wet season and provides excellent camouflage in the canopy. They have the slowest metabolism of any mammal on earth, taking a month to digest their food. The love Hibiscus leaves, it's their version of chocolate! When it sleeps a Sloth can rest its head on its chest. Its arms are nearly twice as long as its legs. They give birth while hanging upside down. They have adhesions on their ribs attached to their internal organs to stop them crushing their lungs when they're upside down. They don't like being handled by humans. Their response to danger is to hold perfectly still, so people don't realize they are causing the Sloths stress. They only eat around 160 calories a day so they are very careful about how they expend their energy. Their slowness keeps them safe by attracting as little attention as possible. They're not all that big, around the size of a large domestic cat or medium dog. The are seriously cute, see picture below!